Back around 1985, I wrote a letter to Julie Bishop. Our little film group was running Sands Of Iwo Jima, and I enclosed a herald we’d put together for the show. There was no reply, but neither was there expectation of one. 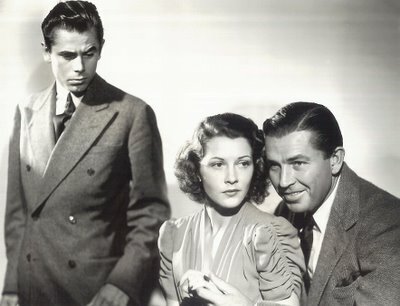 I’d not requested an autograph nor asked what Bela Lugosi was really like. 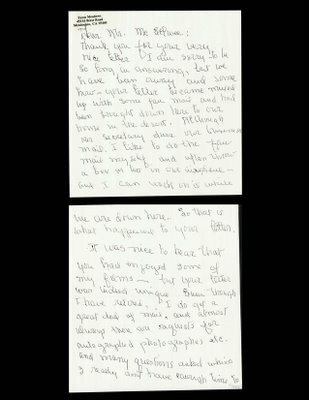 Besides, chances are a woman in her seventies has better things to do than sit around waiting for fan letters, especially one who was by all accounts very comfortably fixed and firmly entrenched among Beverly Hill’s social elite. A friend had met her once at a wedding, and while she acknowledged a career as Julie Bishop, she steadfastly denied having been Jacqueline Wells! That would have dated her screen work back to the twenties, so I can understand a degree of reticence, but none of this encouraged confidence that Julie/Jacqueline would get in touch. Imagine my astonishment when a trip to the post office --- twelve years later --- revealed an envelope from Mendocino, California, and an address unknown to me. Was this some collector with whom I’d long been out of touch? I had to read the entire four-page letter before realizing --- this was Julie Bishop’s reply! 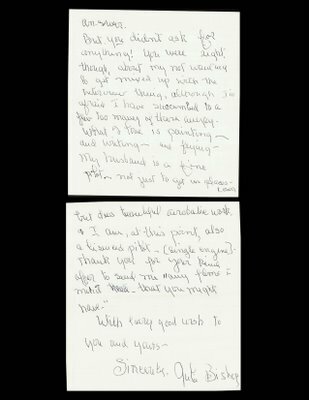 I’ve scanned it here with hopes it will be legible. 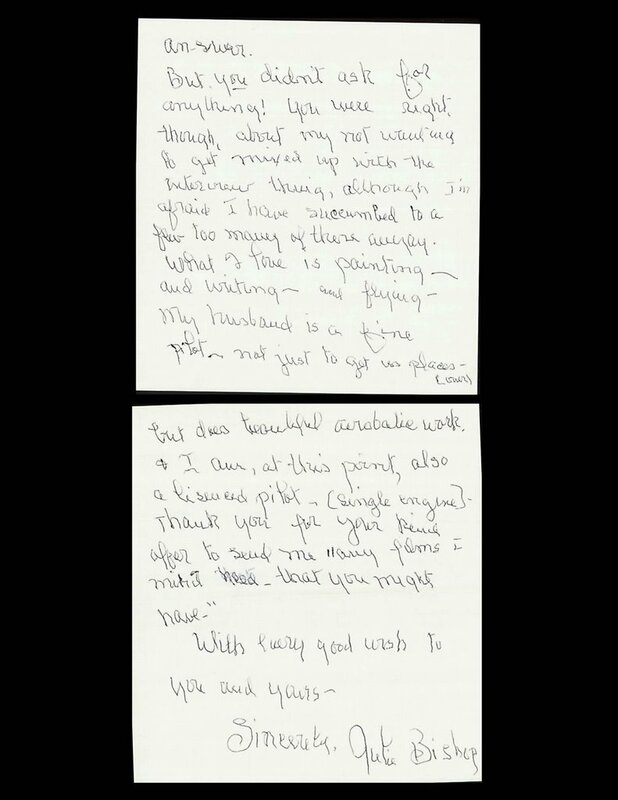 The postmark read April 28, 1997, so she would have been 82 when she wrote it. Click and enlarge for her report of having been a licensed single-engine airplane pilot at the time. 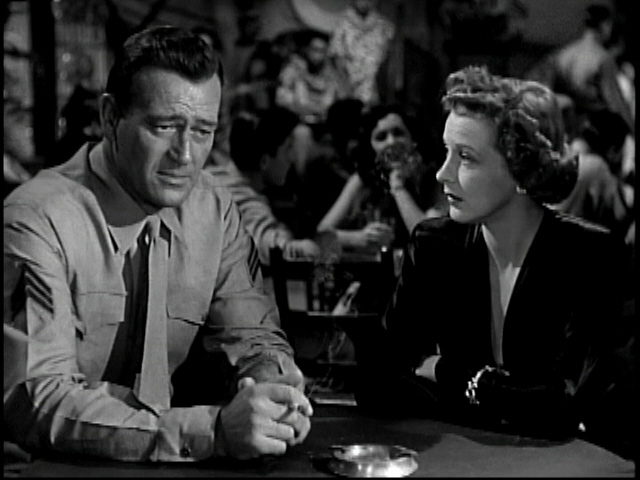 I don’t know of many actresses with such an uncanny knack for being at the right place at the right time, and with so many of the right people. This is a woman known to every cultist in nearly every genre. 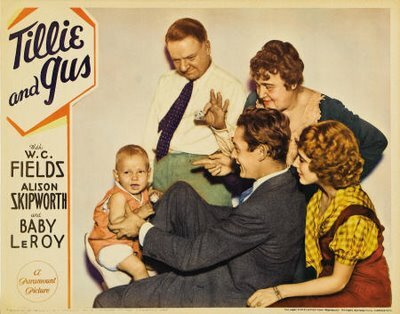 B-westerns, two-reel comedies, serials, horror films, Warner "A’s" --- as Jacqueline Wells, she worked with Charley Chase, The Boy Friends, Laurel and Hardy, W.C. Fields, Buster Crabbe, Tom Tyler, Boris Karloff, Bela Lugosi, Roy Rogers, and Gene Autry. Then as Julie Bishop, there were pair-ups with Humphrey Bogart, Errol Flynn, John Wayne, Alan Ladd, and Charles McGraw. She did a TV series with Bob Cummings, then retired in 1957. Julie Bishop may well have been flying airplanes over my head as I sat and watched The Black Cat and Any Old Port back in the sixties. To have known all these people, let alone worked with them, seems inconceivable. I should think if this lady had ever stopped in for one of those Hollywood Cinecons, she’s have stopped the show cold. No other veteran had a career like this one. One interviewer got to Julie Bishop during those later years. Greg Mank included her in his outstanding book of profiles, Women In Horror Films, 1930’s (HERE), but queries weren’t limited to the horror parts (actually, there was only The Black Cat, though you could dine out a lifetime with that one). Jacqueline/Julie spoke of them all as if it were no big deal. Had she but known. Consider this Saturday scenario, as any number of us growing up no doubt experienced it. 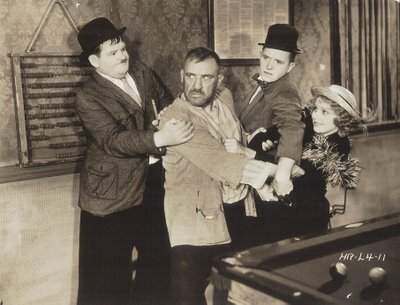 You get up in the morning and wrestle with the antenna to bring in Laurel and Hardy from some distant station --- there’s Jacqueline Wells singing to the boys in one of those two-reel cut-downs from The Bohemian Girl. 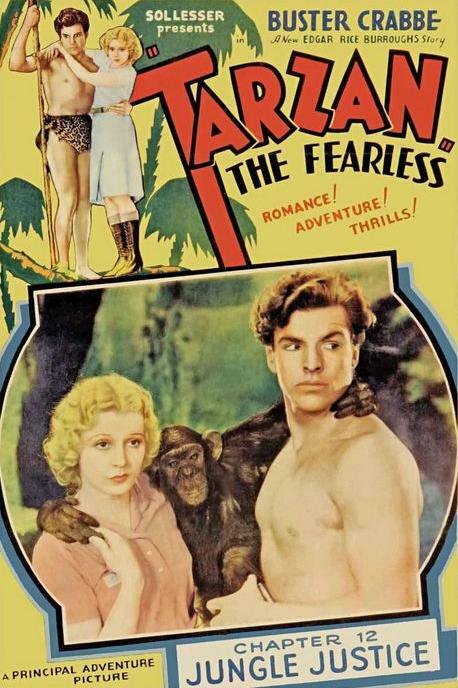 That afternoon, they’re running Tarzan The Fearless, wherein she plays a Jane-inspired heroine opposite Larry "Buster" Crabbe. 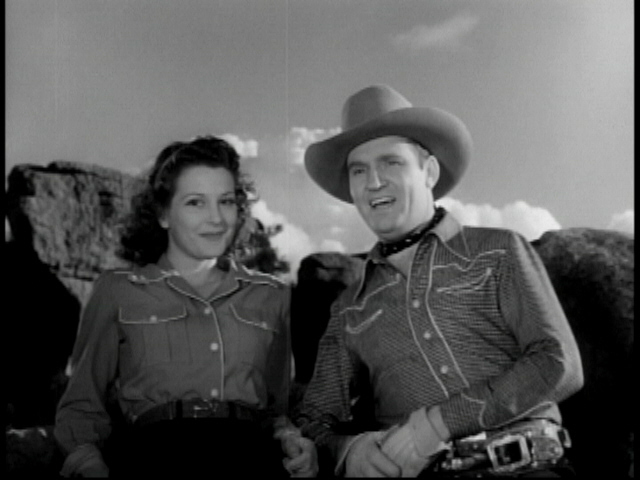 The other channel may well be showing Back In The Saddle, in which she’s paired off with Gene Autry. 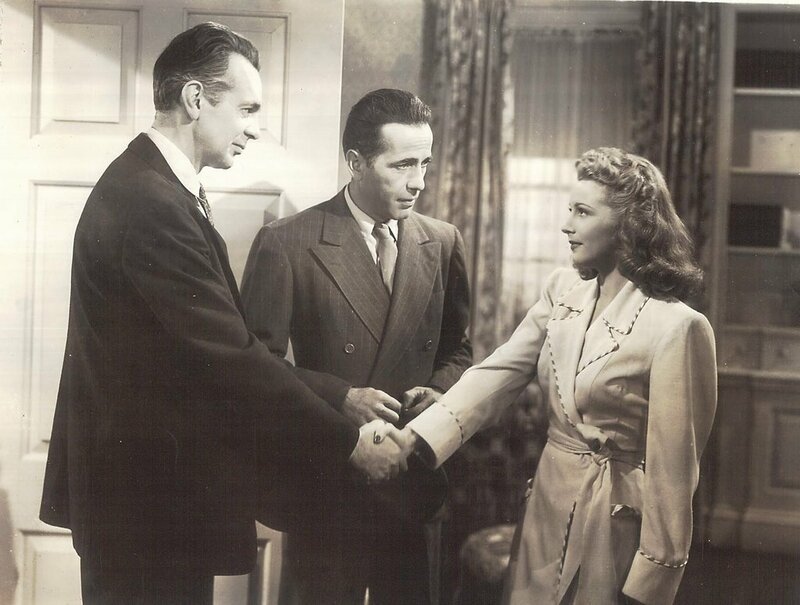 If you’re up late enough that night, chances are you’ll catch her with Karloff and Lugosi in The Black Cat. Something for everyone. Had I actually been lucky enough to meet her, I wouldn’t have known where to begin. All of this was a day’s work for an actress who never hit in the big leagues. The Jacqueline Wells period bore little fruit. She’d been around since the silents, doing kid parts at first, but stars weren’t born playing ingenues in three-day oaters and chapterplays. Worse yet was a contract period at Columbia, one undistinguished "B" after another. There was little else to do but go back into stock and somehow reinvent herself. 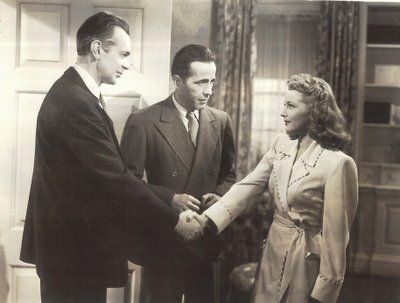 When Julie Bishop returned in 1941 with a Warners contract, many imagined her a newcomer, so complete was the transformation. Trouble is she had to start all over. Warners sent her out on starlet duty as though she were a neophyte, and much of the work was little more than bits. Female leads in Action In The North Atlantic and Northern Pursuit was much more the exception than the rule. Julie Bishop came no closer to headliner status than Jacqueline Wells, but as she was married with a family by then, likely as not it didn’t matter. Jacqueline Wells/Julie Bishop remains a minor name(s) among the footnotes of conventional film histories, but for a lot of us she’s enshrined among the immortals, if not for her own considerable talent, then at least for the extraordinary company she kept. Thanks for another fascinating blog entry. I've enjoyed Jacqueline Wells/Julie Bishop in "The Black Cat", "Tarzan the Fearless", etc. but had read little about her. What a terrific and heartwarming story about the letter! Julie Bishop was one fine dish in her day--whatever name she was going by. Thank you for letting me wake up with her on an otherwise dreary Monday. 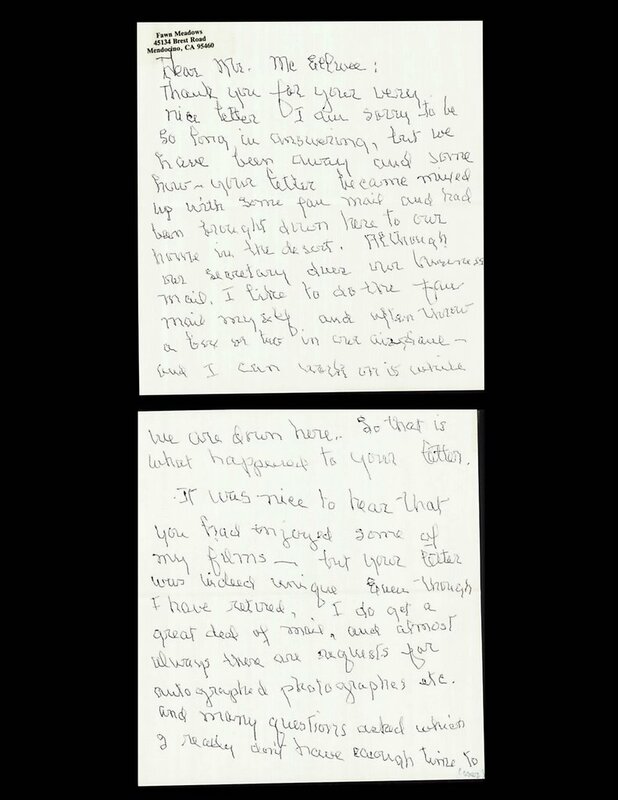 Thanks for sharing the letter - how kind of her to answer. Thanking you-- over a decade later, for this wonderful story on Julie Bishop! I first sat up and took notice of this Dreamy actress in Laurel & Hardy's "THE BOHEMIAN GIRL" (1936); no 'instant info' back then for MOVIE FANS'-- OUR ANSWERS FOUND ONLY WITH painstaking searches through many a book (if you could find ANY reference movie books in the 50's..we couldn't! That is, until Leonard Maltin's "Movies on TV" bible came along) - did I find her earlier name and THAT made for more of my confusion in trying to find out more about this INCREDIBLE GIRL who co-starred with a payload of the top leading male actors each decade continuous as her film career and list of credits result in an amazing mix of everything, for sure. 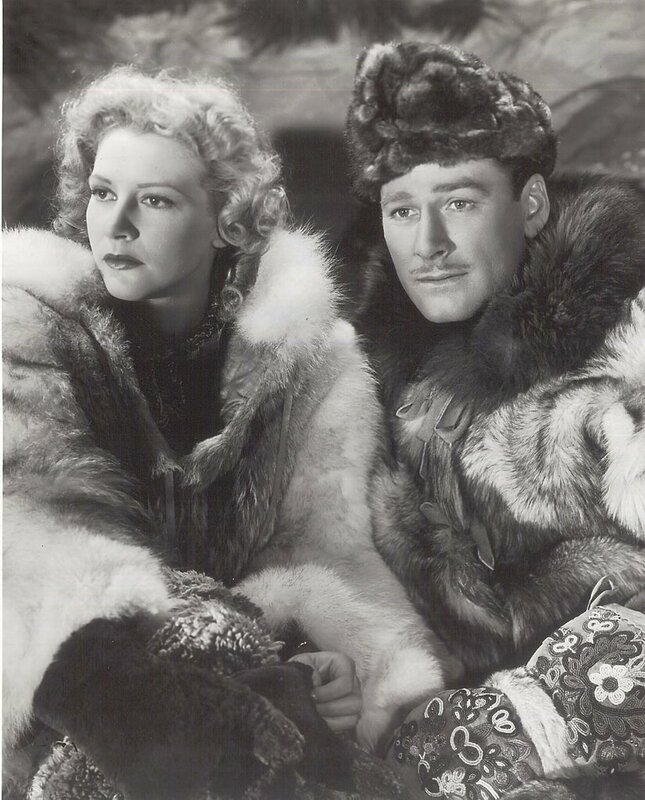 When I discovered that she was ERROL FLYNN'S CO-STAR IN the WARNER BROS. WW2 adventure "NORTHERN PURSUIT" (1943), I realized that my mysterious long admiration for her was really--just beginning! A BIG WOW! for sure, to have a letter from her,(!) and great of you to share it with us! One of the few fan letters I ever sent, and in this case, was glad I did.